Citronella comes from the leaves and stems of lemongrass and has been known for millenia to have many wonderful properties, from repelling insects and fighting fungus, to calming pets and improving skin condition. 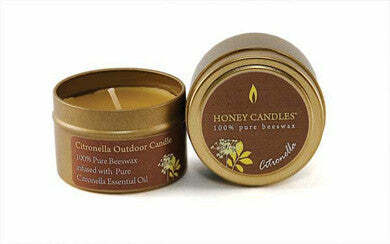 Honey Candles® Citronella Tin is infused with natural citronella oil, with a soft subtle scent that doesn't overwhelm the senses like many synthetic fragrances. A unique combination of lavender and sweet orange makes for a soothing votive candle that is both citrusy and flowery. A dash of black pepper adds a subtle spicy touch to make a one-of-a-kind beeswax candle. A gentle fusion of cinnamon, cloves, nutmeg and ginger essential oils, Honey Candles® mulled spice tin is guaranteed to soothe, and add warmth to any room. Inspired by the pristine wilderness of the Kootenay Forest in the heart of British Columbia, this beeswax votive candle blends the soft scents of pine, fir and cedar essential oils. Rosemary and mint: Three ounces of 100% pure beeswax infused with the wonderful qualities of essential rosemary and peppermint oils, in a classy golden container. Natural: Three ounces of 100% pure beeswax with no added scents or colours - just the way the bees make it! Perfect on the go, this tiny tin packs a big punch, burning for over 17 hours with the classic warm glow of beeswax. Ideal for vacations, business trips or any time on the move! "Essential" oils are aromatic liquids extracted from plant parts that carry the plant's unique essence, as well as many of its healthy compounds. Honey Candles® line of essential oil tins are made with 100% pure beeswax, gently infused with natural and healthy essential oils for a light home fragrance, hand made in Canada. Using only safe and environmentally-friendly ingredients: no solvents, heavy metals, nor any other toxins commonly found in candles. Great for your health, beeswax candles emit distinct compounds when they burn, neutralizing airborne contaminants and allergens. No wonder they've been recommended by the American Lung Association. Better yet, beeswax candles produce a natural glow that closely resembles sunlight.